A Free Resource for TeachersLiterature for Life is expanding its classroom program! 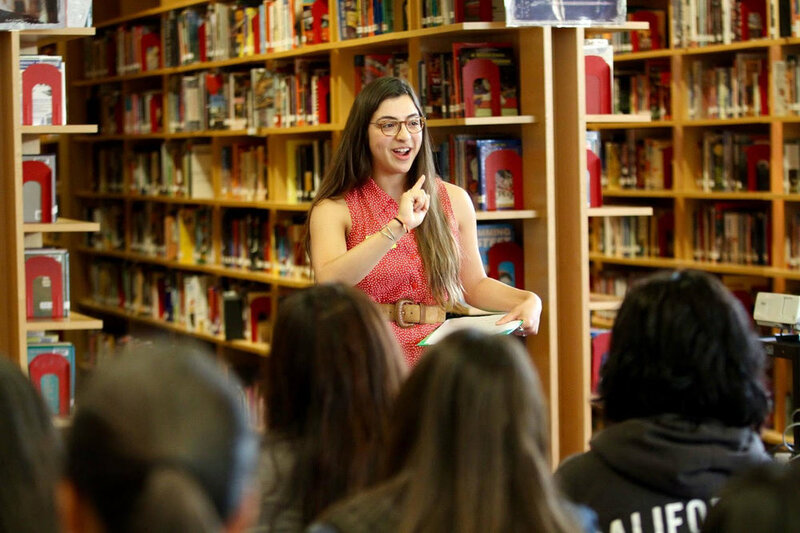 West Adams Preparatory High School founded an authors speakers series to feature Literature for Life writers, and we're reaching out to more schools to do the same. Students connect the stories and poetry they study with the creators, engage in dialogue, and develop their own writing skills. Along with story content provided by leading and emerging Los Angeles-area authors and illustrated artwork, teachers are provided with state-of-the-art curriculum. This model program is funded by the City of Los Angeles, Department of Cultural Affairs and The Ahmanson Foundation and is delivered in partnership with USC’s Neighborhood Academic Initiative (NAI). If your school is interested in participating in the 2017-18 school year program, contact Light Bringer Project. — Jonas Calderon, Fairfax High School, L.A. Literature for Life unites writers, artists, and educators to ignite young minds with a love of reading, writing, and the visual arts. We consider ourselves to be a new kind of beast: part online literary journal, part educator’s resource center, and part community salon. Our goal is to connect LA’s youth with an open source text filled with contemporary works by local writers and artists while simultaneously sharing LA’s rich literary offerings with the world. Our site features five issues with one to two issues added per year, containing a collection of fiction and nonfiction, poetry, short stories, articles, essays, and artwork created for us by writers and artists primarily from the Los Angeles region. Texts and images are paired with tailor­made lesson plans, designed to help teachers introduce locally produced writing and artwork into their classrooms so that students may better see themselves and their communities represented in their curriculum. Filling the gap left by expensive, monolithic, and often outdated textbooks, our literature and artwork are selected to resonate with L.A.­ based youth and celebrate the full diversity of Los Angeles, its culture, and its people. We hope that Literature for Life will become a prestigious publication for writers and artists to showcase their work, a go-to resource for teachers throughout Los Angeles, and a model for cities and schools everywhere for uniting local talent with youth to improve communities. Literature for Life is a program of the Light Bringer Project. All donations to Literature for Life are made through the Light Bringer Project, and are tax­ deductible to the extent provided by law. Léna Garcia currently works with English Language Learners at Pacific Collegiate School in Santa Cruz. She worked as a reporter and as the Assistant News Editor for The Santa Barbara Independent. She was a Volunteer Mentor & Service Learning Intern at Renaissance High School, an alternative school in Watsonville. She has worked for Literature for Life since 2016 as a Copy Editor and a Lead Curriculum Writer. She has a B.A. in Literature from UC Santa Barbara’s College of Creative Studies and a minor in Professional Editing. Her poem, "Ceiling," was published in Vagabond City Literary Journal. Jervey Tervalon, MFA, is the award-winning, Los Angeles Times bestselling author of five books including Understanding This, a novel based on his experiences teaching at Locke High School in Los Angeles, for which he won the Quality Paper Book Club’s New Voice’s Award. Jervey was born in New Orleans and raised in the Jefferson Park neighborhood of Los Angeles where he attended Foshay Junior High. He received his MFA in Creative Writing from UC Irvine and was a Disney Screenwriting fellow and a Shanghai Writers Association Fellow. He is the Founder and Director of Literature for Life. He is also the Co-founder and Literary Director of LitFest Pasadena. Currently he teaches fiction writing and Literature at the College of Creative Studies at U.C. Santa Barbara. His Latest novel is Monster’s Chef published by Amistad/HarperCollins. Angelina Coppola grew up in Los Angeles. She is a graduate of the University of California, Berkeley, where she received her B.A in English with a concentration in Creative Writing. Her writing has been covered in LA Magazine, The Washington Post, CNET Australia, among others. She has extensive experience as a teaching artist and has worked for several organizations in this capacity, including South Pasadena Arts Center (SPACE), WriteGirl, Bold Ink Writers and Day One. She currently writes and teaches in Los Angeles. Scott Gandell wears many hats. He descends from a long line of creatives and business professionals. His experience is as diverse as the subjects he illustrates. You may want to visit Pop Secret Gallery where he has made a home for The Society of Illustrators of Los Angeles of which he is a Board Member. His network is vast and he is a proud alumnus of Art Center College of Design in Pasadena. Athena is a Sophomore at Occidental College who is majoring in Comparative Studies in Literature and Culture. This major, however, extends much further than just her course of study; it essentially describes her entire life. She comes from a mixed background of Greek and Lebanese culture but also went to French and American schools. Due to this and her family, she became fluent in French and English and also understands Arabic. She first moved to Lebanon when she was 7 years old and spent the next four years living between there and New York City. After her final return to the U.S., her interests began to drive her to Literature. She started a Literature and Arts magazine her Junior Year of high school and spent countless hours writing in her free time as well as for school and extracurriculars. Last year she declared her major after falling in love with Greek literature and French philosophy. Her studies into countless philosophers, Jean-Luc Nancy and Jacques Derrida among some of her favorites, greatly developed her writing and passion for her study. This is when this became not just her school work but her lifestyle, she started seeing connections in everything in her life and it greatly developed her cultural background. She now studies Ancient Greek and is reading some of the most difficult literature of the 20th century--Ulysses by James Joyce among the greatest of these.